My grandmother loved the wind chimes that I made for my wife, so I decided to make a set for her birthday. I made them using the same plans (by Leland Hite) as my previous chimes. I used a different chord based on the calculator and decided to use cherry for the wooden parts. 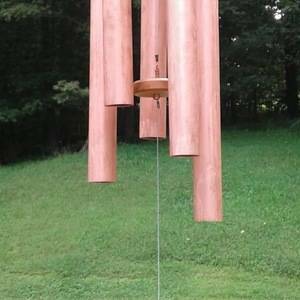 The chime tubes were made with the remaining 1 inch nominal, Type M copper tube from the last set. I had to plane the rough, mill cut cherry down to a half inch (for the mount and striker) and a quarter inch (for the sail). I cut everything out using a jigsaw, then sanded the pieces using a disk sander. 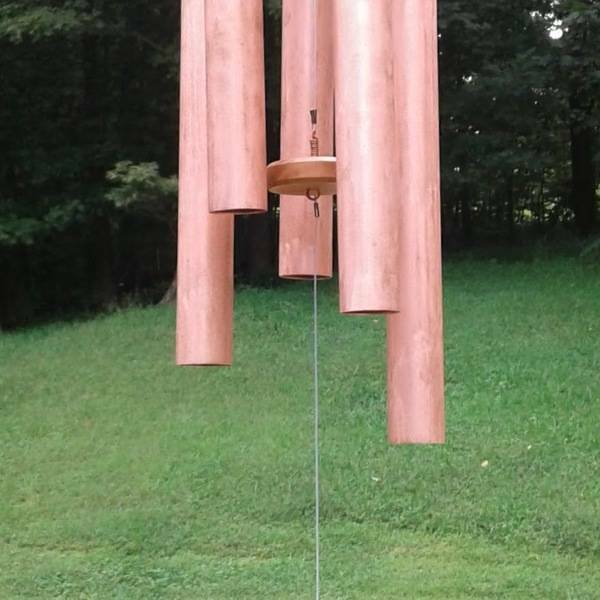 I finished the chimes and wooden parts using water-based polyurethane so that the cherry would continue to darken from UV exposure but be protected from moisture.